July 16, 2018 By Brianne Leave a Comment This post may contain affiliate links. Read my disclosure policy here. The Big Island Hawaii felt like a BIG, wonderful surprise. We stayed most of the time on the northwest side, the sunny side. And at first glance, I was not very impressed. There is a lot of lava rock lining the road and the rocky view stays that way until you get closer to the shore or go inland. Living on the Big Island for a month, we went all the way around the island and we were in awe! We saw huge valleys with waterfalls, green lush foliage, tall trees lining the road, rolling hills in the south with large cliff drop offs into the ocean, ranch lands, and mesmerizing lava flow. 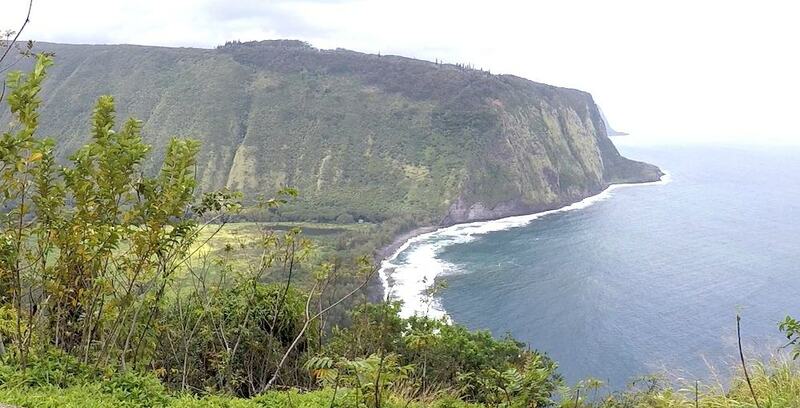 It is called the Big Island Hawaii for a reason. It is the size of Connecticut and it takes planning and time investment to see it all. Every minute is worth it. The Big Island stole my heart with all its landscapes and I came to see the beauty in it all, even the black lava rock lining the road. Here are our top recommendations for anyone visiting the Big Island. See The Erupting Volcano-Big Island Hawaii’s claim to fame! Standing inches from flowing lava is a once in a lifetime experience! Watching the island being created is majestic and humbling to say the least. 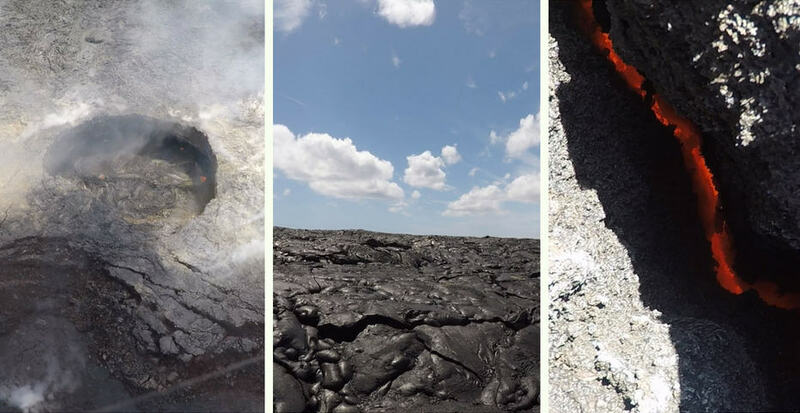 There are a lot of different ways you can experience the Kilauea volcano. You can rent bikes, hike, take a boat when the lava is flowing into the water, or see it all by air. 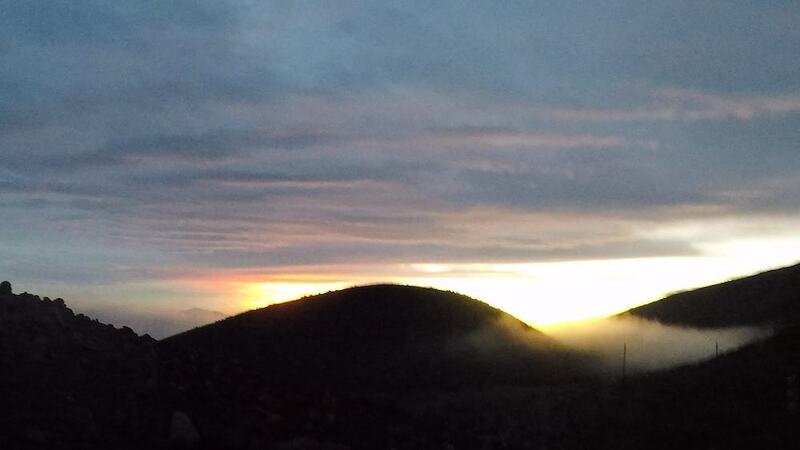 If you hike, I recommend going at sunrise or sunset. This way you can see the glowing lava better without the glaring sun and you can still see the amazing landscape and rocky lava terrain that you are hiking on. Be sure to wear tennis shoes and long pants. The lava rock is very uneven and can be quite sharp if you fall. My husband only had slippers (flip flops) and made the 3 hour hike (flow location is always changing) with only a couple scrapes on his feet, which he was very proud of, but we were hiking in full sunlight and every guide we passed commented on his unsafe choice in footwear. I was also really glad we had sunglasses since it was very windy that day and there is a lot of small glass-like shards that whip around. If you choose to see it all by air, be sure to wear dark colors so the reflections of your clothes on the windows doesn’t get in the way of seeing all that Pele, Hawaii’s volcano goddess, has to offer. Or you could always go on a helicopter tour that doesn’t have any doors!! For this flight, the pilot flies at an angle so you get amazing views of all the sites and awesome pictures without any helicopter in them. I also recommend their rainforest tour- super kid friendly! 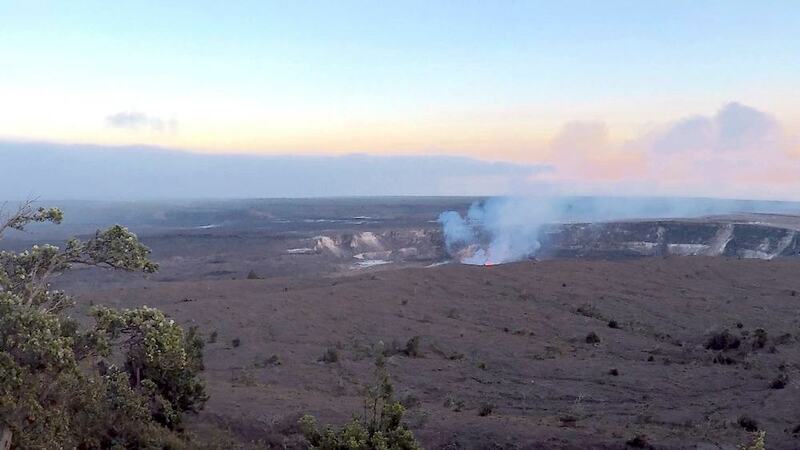 The lava flow changes daily so be sure to check an eruption update here ! You haven’t visited Big Island Hawaii until you have seen lava! I could have spent days exploring all that this park has to offer. It is about a 25 minute drive from where you rent bikes & hike to see the lava flow. It is $25 to enter, but your pass will last a week. From here you will see different parts of the volcano. Go at sunset to the Jaggar overlook and you can see the glowing orange volcanic vent and steam from the Halema’uma’u crater. Waiting 20 minutes AFTER sunset really makes a difference. We walked through a huge lava tube, Thurston lava tube. There are ranger-led hikes through the lush forest and so much to learn in the museums and visitor centers! 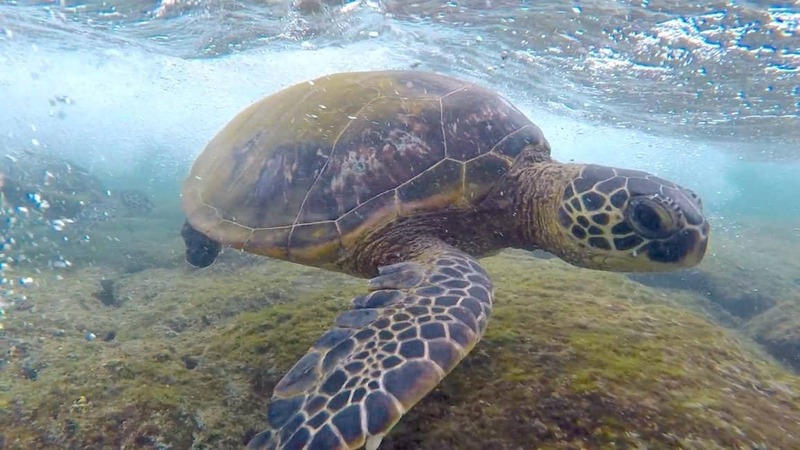 Two of our favorite places to snorkel off the beaten path are 2 step and Kahalu’u Bay. The brilliant sea life seems very unbothered by us snorkelling around them. 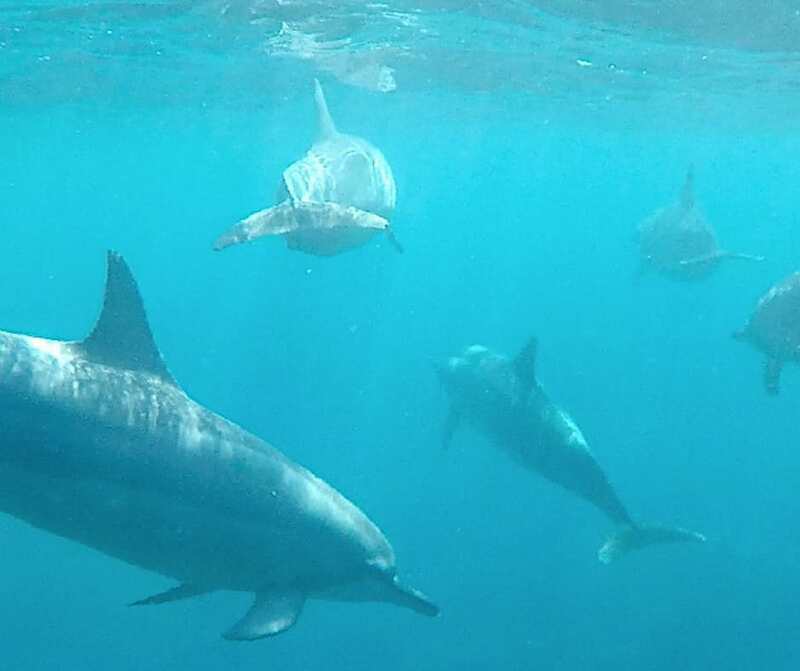 There are awesome tours to get you out to Kealakekua Bay (K Bay), where it has been said to be some of the best snorkelling in all of Hawaii; 2 people in our group swam with a pod of wild spinner dolphins there twice! 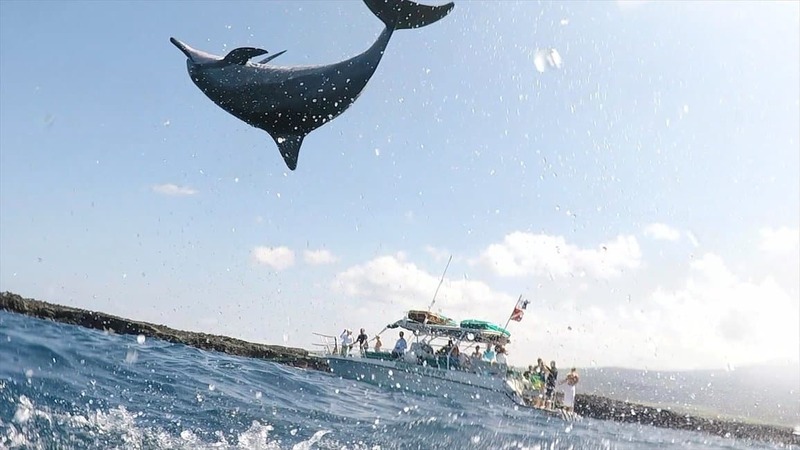 If you don’t want to gamble on the chance to swim with dolphins in the wild, you should go with a tour. We loved everything about our adventure with Sunlight On Water. They are kid-friendly and offer so many adventures including swimming with manta rays and whale watching, when in season. Swimming alongside, above, and through the pod of dolphins was unforgettable. 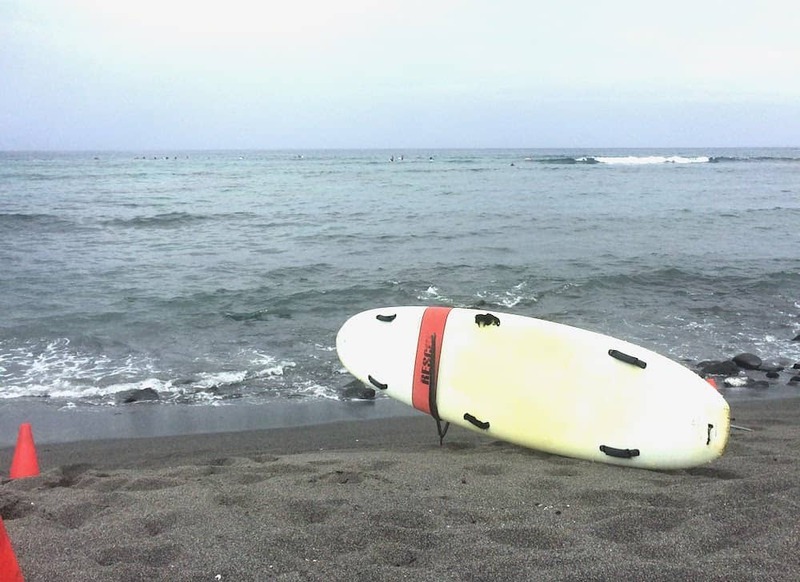 Learn to surf on Big Island Hawaii! 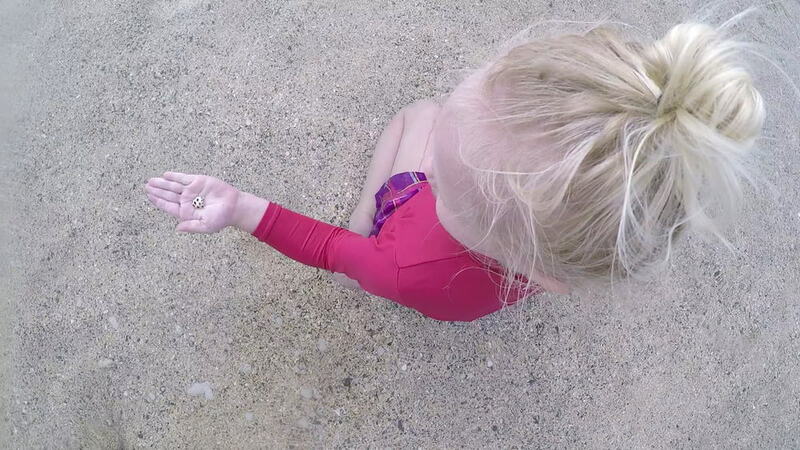 Kahalu’u Bay, where that great snorkelling is, is also a fantastic place for learning to surf. Ever wanted to try? Kahaluu Bay Surf & Sea will get you riding that wave and are top-rated for surf lessons! We had an personalized lesson that was just what we were hoping for having surfed a couple times already. The bay makes for excellent rolling waves to hang ten. A day at the beach with kids playing for hours, enjoying themselves (…and no fighting! )….that feels like a vacation. There aren’t as many beaches on the Big Island as the other Hawaii Islands because it is the youngest island. Yet, we were told by a local that if you went to a new beach every day of the year you still wouldn’t see them all. Well, where should you start? Hapuna! Hapuna beach and 69’s (the beach right next to it, near mile marker 69, also called Waialea beach) are the softy beaches, as my kids called them. Hapuna has long sandy beaches and great little waves for boogie boarding. There is also a fun cave to explore on the south end of the beach during low tide. 69’s has great shade options, but is much smaller. If you want a little variety, there are black sand beaches all over the island and even a green sand beach you can access with 4 wheel drive at the southern tip of the island. The lookout is stunning with huge, steep walls lined with waterfalls. It is easy to see why it was such a special place and residence for fifty generations of Hawaiians until a tsunami in 1946. It remains a majestic valley, which you can only reach with 4 wheel drive, or shuttle, or an intense leg workout. While you are in the area, you should treat yourself to some hot malasadas at Tex’s. They are the best we’ve found on the island and worth the drive from wherever you are staying on the island. Mauna Koa boasts to be the tallest mountain in the world when measured from its base (below sea level). I’m not sure how I feel about that title, but it is incredible to think of a snow-capped mountain in Hawaii and getting to see the stars from the top! Be sure to go to the visitor information center where they set up telescopes and have people out there showing constellations with laser pointers on Tues, Wed, Fri & Sat. Get there in time for a little hike to sunset hill or all the way to the summit for an incredible view as the sun goes down. You might also look into a Ziplining Adventure in Hilo, as there’s currently a deal for it here. There is also a deal for whale watching here! …Or just look at it. Most likely you will drive past this point on your way to the volcano, so I recommend making sure you stop and enjoy the view …or drop. 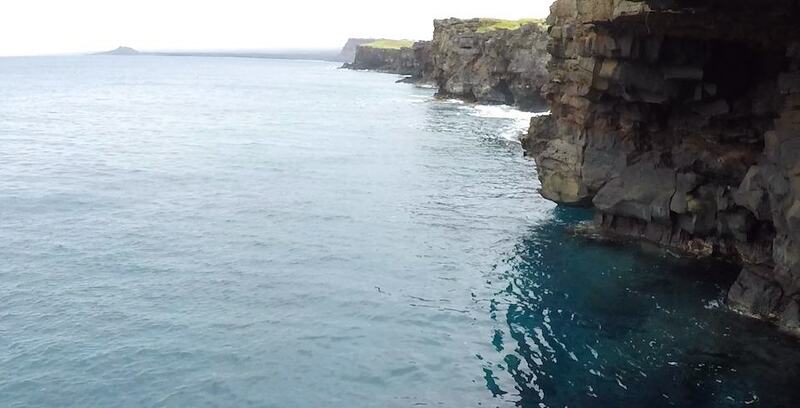 The landscape turns to rolling hills with cliffs that fall into the ocean. This is also near the area where you can hitch a ride to the famous green sand beach. When you leave, stop at Taps Takeout, where everything is delicious. He makes his own bacon everyday for pete’s sake. I had the best tomato of my life here. Then get some homemade seared pineapple ice cream at the store next door. Ohhh, my mouth is watering! Learn to Hula on the Big Island! There are many free events and opportunities to learn about the rich island life. Buy a local newspaper and get the calendar of events from the local markets. Go to the Kona historical society museum and learn the traditional art of making bread in a stone oven. Visit the Captain Cook Monument. The shops at Mauna Lani have free hula shows on Mondays and Thursdays, where they also teach basket weaving, traditional Hawaiian games, and let you thread your own plumeria lei. Farmer’s markets are a great chance to try new fruit, support local artists, and hear live music. Hawaiian history and traditions are enchanting and can only enhance your visit and spirit of Aloha! 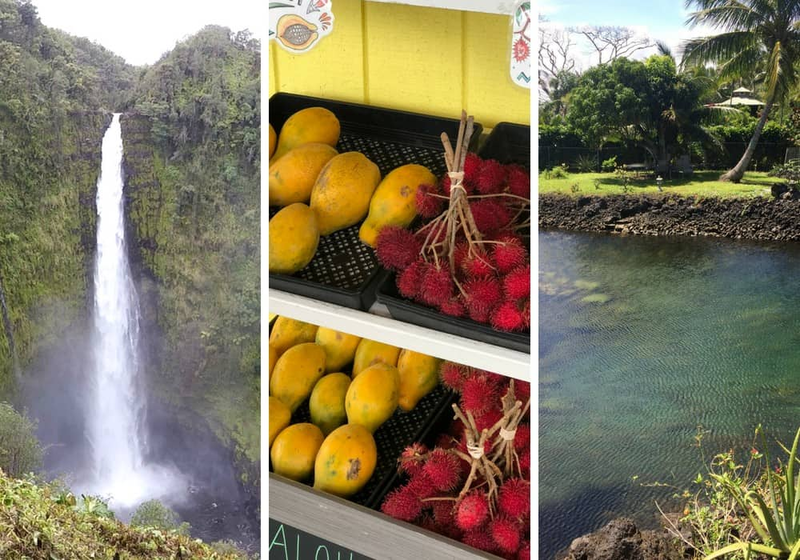 You’re going to want to stay on the North side or the East side when visiting Big Island Hawaii (Kailua-Kona and Hilo), and if you can arrange it you might stay a few days on each side. The reason for staying on the Hilo side is the close proximity to Volcanos National Park, where you can easily spend a couple days. Hilo is also the only legal side to drive up to the summit of Mauna Kea with a rental car. On the Kailua-Kona side, is where you will explore the sights, beaches, historic and cultural locations, and attractions that are on that side of the island, including Pololu and Waipio Valleys, which are easily day trips. If you decided to stay on both sides of the island, you might want to fly into one airport, and fly out from the other. I also highly recommend looking at vacation rentals in Hilo and vacation rentals in Kona, as you can often find some killer deals that beat out the hotels. We hope you enjoy your trip! 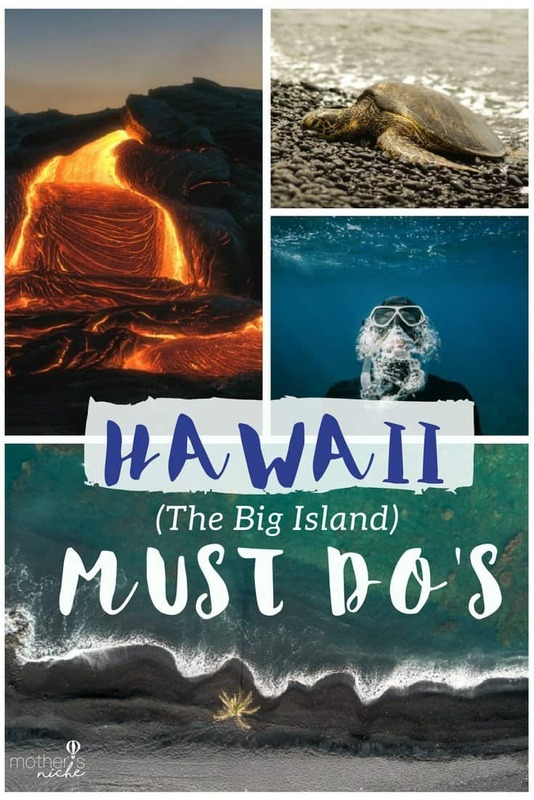 Make sure and visit our Hawaii Tips post where we share everything we wish we knew before our first trip to Hawaii (there have been several trips now and we’ve learned a lot). Have you Been to Big Island Hawaii before? 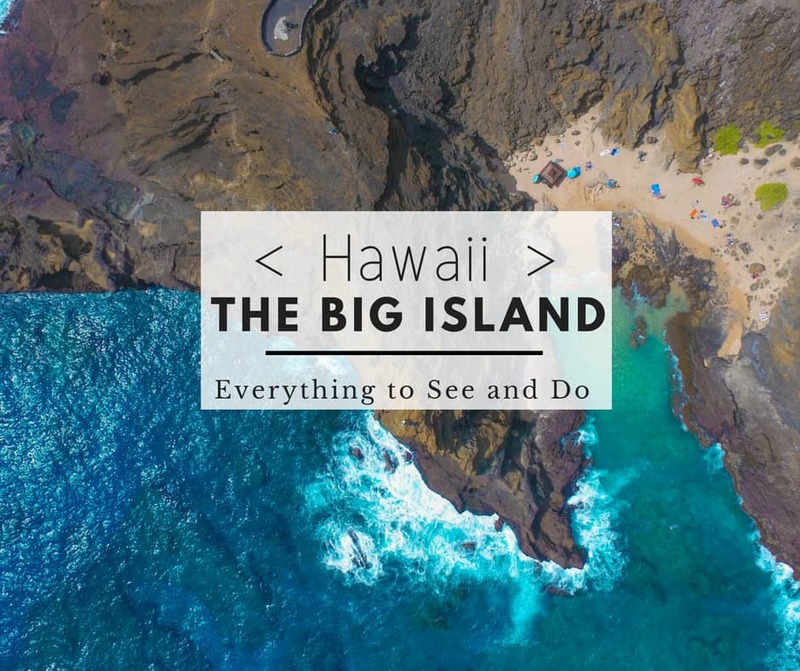 What are your best Big Island travel tips?